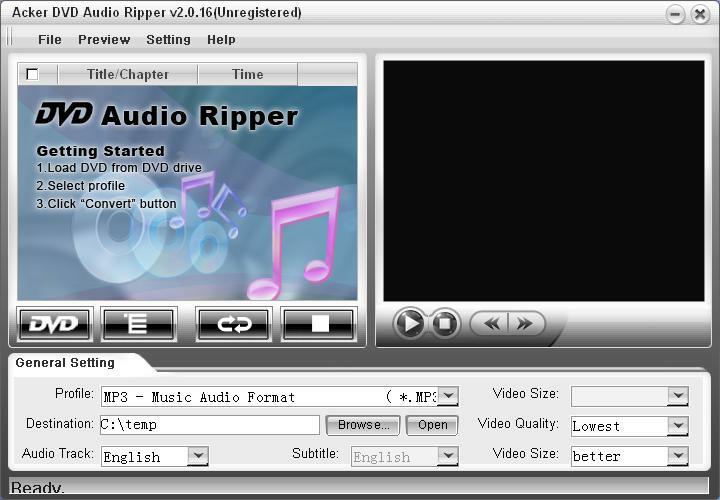 Acker DVD Audio Ripper is a software DVD movie soundtrack ripper which can rip DVD audio to MP3, MP2, M4A, WAV, AAC, AC3 and OGG formats. You can use DVD Audio Ripper to extract DVD audio and rip DVD movie soundtrack to MP3 and convert DVD to WAV with complete sound effects. It will make the task of ripping and converting DVD audio to MP3/M4A/AAC/AC3/WAV/MP2/ OGG a breeze! ...... in 1 step and is 400% faster with complete sound effects. With easy operation and fast speed, the DVD Audio Ripper and DVD movie soundtrack ripper software will make the task of ripping and converting DVD audio to MP3/M4A/AAC/AC3/WAV/MP2/ OGG a breeze! Free Download Acker DVD Audio Ripper to have a wonderful experience!!! Acker will provide free update service and One-Day-Email support service! Rip DVD to all most popular video and audio formats. Qweas is providing links to Acker DVD Audio Ripper 2.1.92 as a courtesy, and makes no representations regarding Acker DVD Audio Ripper or any other applications or any information related thereto. Any questions, complaints or claims regarding this application Acker DVD Audio Ripper 2.1.92 must be directed to the appropriate software vendor. You may click the publisher link of Acker DVD Audio Ripper on the top of this page to get more details about the vendor.